With rapidly evolving regulations around the world and the worsening global water shortage, industrial facilities in every corner of the world are facing new challenges to effectively and sustainably manage their water and wastewater needs. As such, mine plants, power production facilities and other industrial institutions increasingly are turning to on-demand wastewater treatment systems that provide flexible solutions to meet a variety of treatment needs. Delivered in a self-contained and self-sufficient trailer, on-demand water solutions allow plant operators to quickly produce process or potable water in emergency situations to keep water and business flowing. The purpose of these mobile solutions is to provide water that customers need when and where they need it. 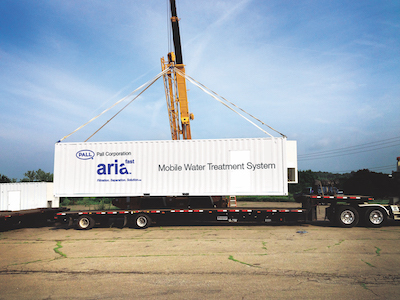 Given the mobile functionality of these units, they can be transported and quickly deployed to provide a solution for a variety of water and wastewater needs. The trailers do not require construction or other infrastructure investments to operate, so they are well-suited for use following a natural disaster, such as flooding, or unplanned plant shutdowns. They can be operational in a matter of hours and they are capable of producing water as soon as they are online. Beyond unplanned, emergency deployments, rapid response is increasingly needed to meet changing regulations and water quality requirements around the world. To avoid costly fines and plant shutdowns, mobile units offer flexibility. They can be rented for any time period whether the system is needed for a week, month, quarter or a year. While it is impossible to predict natural disasters, plant malfunctions or when major regulations will be enacted, adequate preparation from plant managers can ensure that facilities are able to act quickly, efficiently and intelligently. To best prepare for the unplanned, plant managers should develop and practice emergency operation plans and procedures to respond and recover from natural or man-made disasters. At an altitude of 3,000 meters, a gold mining plant located in Peru sought to protect its existing reverse osmosis (RO) unit from contaminated leachate water. The plant’s conventional treatment could not provide a stable and high-quality stream of water for mining production. It required a quick, reliable wastewater solution to meet peak demand in the summer months, treat mine leachate, and prevent the existing RO membranes from collapsing or releasing contaminated water into the environment. To avoid any form of precipitation and prevent the pre-existing membrane from collapsing, the gold mining plant initially deployed one unit that kept the treated leachate water neutral and chemically stable. The integrated mobile membrane system allowed the gold mining plant to rapidly meet water supply demand and remove the colloids, algae and particulate matter from the leachate water. The mobile solution eliminated the need to erect new buildings, which was advantageous given the challenges associated with the geography of the plant. Within six months of operation, the mobile membrane system solved the plant’s wastewater challenges and met Peru’s environmental discharge regulations. In 2014, the Bralorne Gold Mine located in southwestern British Columbia, Canada required shutdown due to a high water event and tailings storage freeboard concerns. To address the problem, Avino Silver & Gold Mines, the mine’s owner, required a faster and more affordable and reliable treatment solution than its existing media filtration unit. The company sought a solution that could handle construction challenges, remove contaminants and protect local waters. With a desire to limit downtime and prepare the mine for production, the unit was ordered, delivered and commissioned to produce treated water within 60 days of receiving the order. The mobile membrane system was reliable and capable of meeting British Columbia’s strict environmental regulations. In addition to removing the solids and particulate matter from the water, the membrane unit could also meet the arsenic limit of 0.5 mg/L during the peak weeks of the spring freshet. On average, freshet water flow rates from mine workings are 13 liters per second and increase up to 20 liters per second, but with Bralorne’s maximum flow recordings almost doubling that, the containerized membrane unit had the highest capabilities, reaching 35 liters per second with no detriment to water quality at higher flow rates. Aside from emergency applications, regulatory needs for rapid and compliant solutions also are driving mobile membrane unit deployment in industrial applications around the world. As an example, a major European power plant faced with meeting stringent water quality requirements needed to find a more reliable water source to feed an existing demineralization unit combined with treatment technology. Ultimately, the plant deployed two containerized filtration systems with an RO unit for control of biological and organic constituents and the removal of particulate matter from the feed water. This membrane solution met the water quality needs of the power plant with no interruption to plant productivity. The mobile membrane units were quickly delivered and installed, with the containerized systems arriving in February and startup completed in April. The response speed saved the power plant from a potentially costly shutdown and exceeded the requirements of the pre-existing demineralization water plant. Whether facing unplanned wastewater needs resulting from equipment failure, a natural disaster or a rapidly changing regulatory environment, industrial facilities increasingly are relying on mobile membrane technology. As the needs of plant managers continue to evolve, these on-demand containerized membrane systems will deliver quick, flexible solutions in a variety of industrial environments. Ron Thomas is industrial sales manager for Pall Water. Thomas can be reached at [email protected].